Dr. Sambhu Nath De is the President of the college. His wife is Molly and they have two daughters, Anita and Asha. 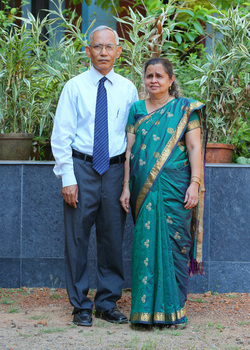 Dr. & Mrs De were commissioned by Fourth Baptist Church in Plymouth, Minneapolis, USA and they minister in India under Baptist World Mission. They have started two churches- Emmanuel Baptist Church in Cochin city and Faith Baptist Church in the college campus which is 41 K.M. north of Cochin. Bible classes are conducted in Assamese, English, Malayalam, Manipuri, Oriya and Tamil languages.